In May we celebrate International Month of Awareness for Vascular Birthmarks, which prompted Elizabeth Mamacos to share her experience to raise awareness. I want to share my story and let other parents know they are not alone, there are treatment options for their beautiful babies, and support is available if needed. My son was two months old when his nose turned blue. As a second-time parent, I worry a little less about his health than I did with our first born, and I thought he just had very thin skin on the tip of his nose. My husband, on the other hand, was more concerned. The blue colouring wasn’t going away, but our paediatrician didn’t comment on it at his six-month check, and we actually forgot to ask. But two months later, during a GP visit for a stuffy nose, my husband asked the doctor if this was normal. The doctor examined him closely, then unceremoniously announced that in her opinion it was a hemangioma. What on earth was that, we asked. She turned to her computer, Googled the word and then twisted her screen towards us. Glowing from her desktop was an image of a large, dark and deformed nose hiding the face of an adorable infant. Obviously our son didn’t look like that so we were in the clear, right? 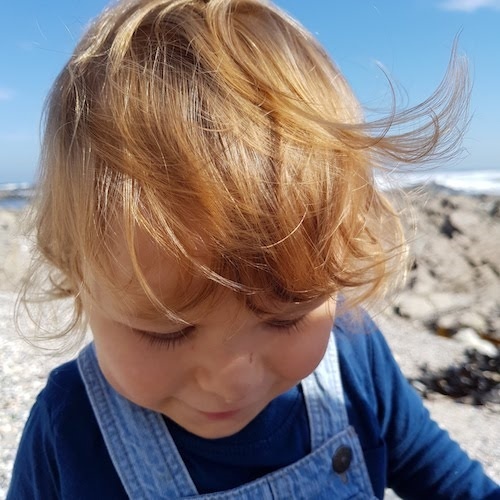 Turns out these things grow fast, and it was as if his hemangioma got the memo that day, because by the time our paediatrician was back from the holidays two weeks later, it was noticeably bigger. They typically manifest as a birthmark that looks like a rubbery, bright red nodule on the surface of the skin. Due to this appearance they are often called strawberry marks. In short it is a tumour, but medically speaking it’s a noncancerous growth of blood vessels. They are among the most common birthmarks in children and the most common benign tumour in children. Hemangiomas usually appear shortly after birth and grow quickly during the first year, and babies can have one or many. Some types of hemangioma, classified as cavernous, grow internally. They can form on the liver, the heart, the eye, the nasal tip, the skin and other places around the body. Not generally dangerous in themselves, they can grow rapidly and cause damage to surrounding organs, block airways or ulcerate and cause infection. Our little boy has a nasal tip cavernous hemangioma. With a confirmed diagnosis and assurances that it wasn’t malignant or blocking his airways, we were ready to talk about treatments. There are very few options, and often doctors recommend leaving it, as in many cases the growth slows, stops and then shrinks of its own accord. With our son being so young, the position of the malformation and the sudden increase in growth, we decided to treat it. This was not as easy as we’d hoped it would be. In South Africa, Propranolol is the treatment of choice. A beta blocker, it reduces blood pressure and heart rate and is commonly used by adults to treat high blood pressure. In the UK and USA, babies are usually hospitalised and monitored for the first week of treatments, but in South Africa patients are started on very low doses and monitored over time as the dose is slowly increased. Because the medication is designed for adults, it doesn’t come in small enough doses for babies, so we had to turn part of our kitchen into an apothecary. Every morning my husband grinds the small tablet in a granite mortar and pestle, measures out clean water to stir the pink powder into, then uses three syringes to carefully measure and store the three exact doses for the day. Each must be administered orally no less than 6 hours but no more than 8 hours apart. This is important, because if our son gets the wrong dose, his heart could stop beating. Side effects of Propranolol include dizziness, light headedness, tiredness, nausea, vomiting, stomach pain, vision changes, trouble sleeping, unusual dreams and restricted blood flow to the extremities. None of these are any good for a 9-month-old baby. But it is the last one that has an effect on the growth, essentially starving the malformation of blood and causing it to stop growing and to hopefully even shrink. 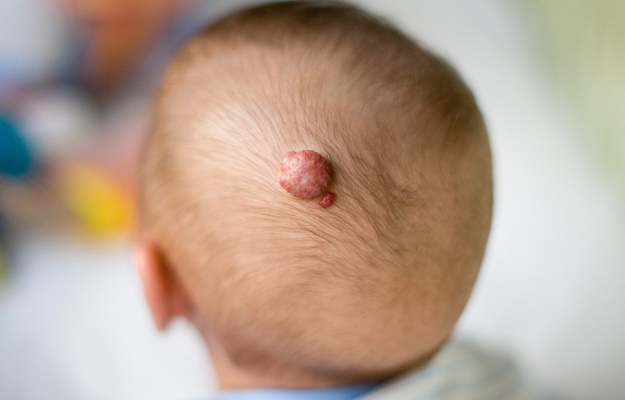 If the hemangioma is a cutaneous infantile capillary hemangioma, such as the typical strawberry birthmark on the skin's surface, it may be treated with a topical ointment called Timolol. This drug has the same effect as Propranolol, shrinking the blood vessels by starving them out. Laser is also a popular choice for some types of hemangioma. Treatment can last from a few months to several years, and sometimes, depending on the case, surgery may be required. For us, it’s been six months. Our boy’s nose looks fairly normal and not many people ask us what’s wrong with him anymore. Surgery doesn’t seem to be a necessity and we’re optimistic that in a year or so it will have faded away entirely. Why do hemangioma birthmarks grow? Why did this happen to him? We don’t know, And I think we’ll never know. Various studies into the causes have come up with some commonalities, but none of these explain my son’s tumour. Between 2% and 10% of babies develop hemangiomas, and some are thought to be more common if the baby has a low birth weight, is female, has white skin, is premature, is one of a multiple, there is a family history of infantile hemangioma or the mother is of advanced maternal age. We’ve found support not only from our paediatrician and GP, but also from other parents whose children have hemangiomas. Online, the most popular group is an international one called Hemangioma Parents Group with nearly 8 000 members. While treatment options differ globally, it’s good to read other parent’s experiences, and to see how kids improve over time. Most grow up and have no trace of the original growth or discolouration, which is enormously comforting when you’re first faced with the diagnosis. Does your child have a birthmark? What is its appearance, have you tried to treat it and what was the outcome? You're welcome to send your stories to us at chatback@parent24.com and we may publish them.